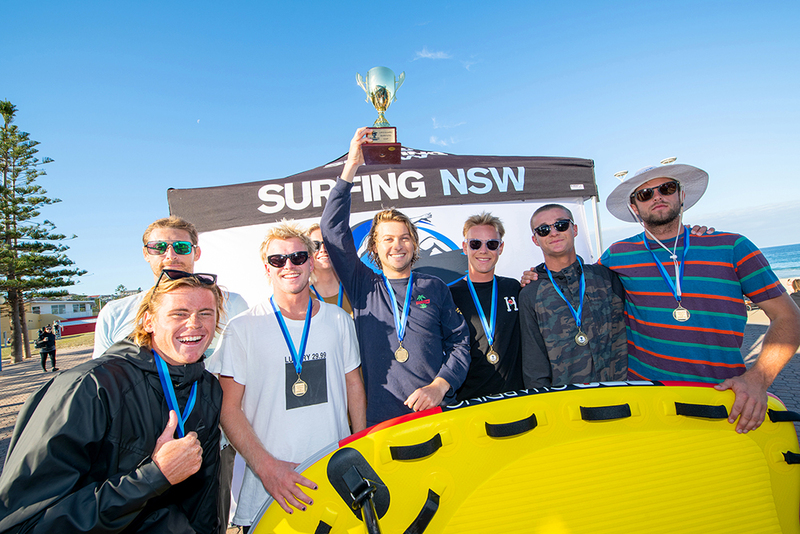 CENTRAL COAST TAKE OUT INAUGURAL LIFEGUARD SURFERS CUP AT MAROUBRA. Central Coast Lifeguards have taken out the inaugural Lifeguard Surfers Cup after a day of exciting action in tricky two-to-three foot waves at Maroubra Beach. The Central Coast team that consisted of Wade Clemens, Riley Laing, Saxon Lumsden, Nathan Foster, Toby Cracknell, Robert Coote and Harry Carpenter dominated the day, consistently posting high scores over all of their tag-team heats. Central Coast team member Saxon Lumsden set a high standard in the final dropping an impressive 7.83 wave score (out of a possible 10 points) to allow the Central Coast team to gain the upper hand against the other finalists. Dean Bowen claimed the wave of the day for a massive 9.17 wave score he posted in the final of the event, which boosted the Wollongong team into the runner-up spot. Over the course of the event, former UFC fighter and big wave surfer Richie Vaculik joined fellow Maroubra local and personal trainer Johnny Gannon to have a frank discussion about their personal paths and share their story with all competitors. The one-day event saw seven teams of five lifeguards competing. Teams had as many reserves as they liked and were allowed to rotate their surfers in and out of the team throughout the day. The event incorporated a tag-based format where surfers needed to start on the beach and tag their teammate and paddle out, with one wave from each of the five surfers going into the teams overall tally. The winning council took home a Jet Ski Rescue sled, courtesy of event partner Pro Guarding, while Accidental Education and Wollongong First Aid, offered funds towards the post-event function. The event was the brainchild of Randwick City Council Lifeguards and Surfing NSW who noticed the depth of talent that exists amongst lifeguard contingents in the state. The 2019 Lifeguard Surfers Cup was proudly supported by Randwick City Council, Pro Guarding, Accidental Education, Wollongong First Aid, AwayCo and Surfing NSW.